After you create a metric, the discovery process begins! If you haven't created a metric yet, go here to learn how. After you create a metric, it automatically displays in its Explore View. From here, you can explore your metric, applying different types of aggregation, experimenting with visualization types, and segmenting your data to break it down and see it from different perspectives. You can also apply filters based on time span (for example, yesterday, today, last 30 days) and compare your displayed data to a previous time period. When you explore a metric, you are not altering the underlying metric data - you are selecting different options for viewing and processing the underlying data in an experimental, investigative way. Changes made to a metric while in its Explore View are remembered and will display the next time you log in. You can enter a metric's Explore View from the Metrics List page (where all of your metrics are displayed). You can also enter a metric's Explore View from within a Metric Board. In the left navigation sidebar, click Metrics to display the Metrics List page. Select the metric you want to explore. Recent and Starred metrics are directly accessible by selecting them in the left navigation sidebar. Select from the available options in the configuration panel to modify the default display for the metric. With the Metric Board in View mode, click the 3-dot menu for the metric you want to explore and select Personalize. With the Metric Board in Edit mode, click the 3-dot menu for the metric you want to explore and select Configure. When you select options in either the configuration panel or in the Explore View window, the results are instantly reflected in your metric. Type - Choose the best visualization to display your data meaningfully. Available visualization types are: bar charts, line charts, pie charts, and scorecards. Note: The line chart displays by default when you create a metric. Break lines for blank values - When there are gaps in data, for example, if data is not refreshed during a time period, you can choose to break the chart lines to show the gaps in data. Alternatively, you can display a continuous line, where a line is drawn between known data points to fill in the gaps. By default, we break lines for blank values but you can deselect this option if you'd rather see a continuous line. Aggregation - Choose how you want the metric's value to be aggregated over time. Available aggregation methods depend on the type of data in your metric. The selected default aggregation is based on the the choice you made when creating your metric. Show as cumulative - Select this option if you want to view your metric data as a cumulative sequence. Viewing your metric data from this perspective illustrates growth over a time period. Note that this option is only available for line charts and only when the aggregation type is either Sum or Count. Segment by - Choose the dimension(s) by which you want to segment your data. Breaking down your data enables you to see your business performance from different perspectives. For example, you might choose to segment your sales data based on region, sales rep, or product type. Note: To optimize clarity in your visualization, we recommend building your metric using fewer than 20 members. If your metric includes > 20 members, all members above the first 20 will be grouped together under “Other” in your visualization. Over - Choose how you want your data to be grouped. Klipfolio® automatically sets the time periodicity to use for your metric based on the date range you selected. For example, if you're viewing a date range for your data for the "Last 7 days", the auto-periodicity will be set to "Auto (Daily)". If your date range is "Last 8 weeks", the auto-periodicity will be set to "Auto (Weekly)". You can override the auto-selected time periodicity by choosing an alternate option from the drop-down list. By default, the x axis displays time but bar charts enable you to select either a time dimension to group by or a non-time-related dimension. Note: This option does not display for pie charts. Trend line - To more easily see data trends over time, you can apply a trend line to your visualization. Select Moving Average if you want to smooth out fluctuations in data so you can more clearly gauge patterns and trends. Select Linear if you want to see a straight line, indicating the general direction in which your data is heading. When you select either option, a line is added to your chart. If you also select Show as cumulative, the trend line is drawn using cumulative data. Note: This option is available for bar and line charts. Comparisons - Choose to either apply no comparison or to compare your data to a previous period. Comparisons are made between equivalent time period types. For example, if the date range selected is "today", then the previous period will be "yesterday". When you select "Previous period", for line and bar charts, the previous period's data displays in the background as a grey dotted line. For scorecards, the percentage difference between the current value and the previous value (the delta) displays. Green is used for data that has improved and red for data that has regressed. In score card visualizations, when comparing data from a partial period, we compare it to a previous partial period. For example, if you are halfway through a month and want to compare to the previous month, your metric will be compared to the same period of the previous month. Pie charts do not currently display comparisons to a previous period. Filters - Filter your data by selecting the members to include for each dimension. 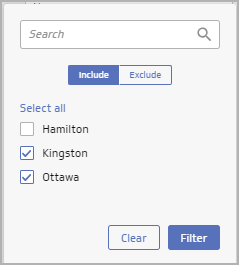 For example, if the dimension is "City", you might choose to filter on "Kingston" and "Ottawa", to see data for those specific cities. See the example below. If your metric includes a lot of members, you can use the Search feature to quickly find them. Date range settings - Choose the date range you want to display for your metric. There are many to choose from, for example, "Today", "Yesterday", "Last 7 days", "Last 30 days", "Last month", "Last 12 months", and "Last Year". The default setting is "All Time" with a date range (in brackets) that includes all data for the metric, from the first data point to the last data point.